The Memoir was highlighted during TCC’s 12th annual Literary Festival held April 1-4. Guest authors visited each of the college’s four campuses beginning with keynote speaker Anchee Min. Min shared her life experiences growing up in communist China, and talked about her best-selling memoir, “Red Azalea,” which has been compared to “The Diary of Anne Frank.” She has written six works of historical fiction since, and her new book continues the story where “Red Azalea” left off. “The Cooked Seed: A Memoir” is scheduled for a May release. Gwen Cooper spent 10 years working in nonprofit administration, marketing and fundraising prior to writing “Diary of a South Beach Party Girl” in 2007. She has since written “Homer’s Odyssey,” a memoir for anyone who has ever fallen in love with a pet, and “Love Saves the Day,” a novel narrated by a brown tabby named Prudence. Tim Seibles, a member of ODU’s English faculty, is the author of numerous poetry collections, including “Hurdy-Gurdy,” “Hammerlock” and “Buffalo Head Solos.” His most recent release, “Fast Animal,” was one of five finalists for the 2012 National Book Award. Seibles has served as a workshop leader for Cave Canem, a writer’s retreat for African-American poets and for the Hurston/Wright Foundation, dedicated to developing African-American writers. 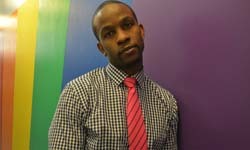 Former Washington Redskin Wade Davis is a writer and activist who shares his experiences as a gay professional athlete. Davis is also the assistant director of job readiness/career exploration at Hetrick Martin Institute, a nonprofit for LGBTQ youth. His most recent book, “Interference,” chronicles his adolescence, his “coming out” and beyond, focusing on his relationship with his mother, playing in the NFL and working with the Obama campaign. The festival also included faculty, staff and student readings of original works.